Since I’m not home during the day, I don’t always get to see Namine’s progress firsthand. When I do, though, it’s awesome. Namine is getting pretty good at reading. She’s got a couple beginner books in her room that she prefers; one of them is Frozen, so no surprise there. One night Jessica and I were in the living room, and Namine was playing in her room. We can usually hear her playing — she’s often quite loud when she plays (not a bad thing, she’s just exuberant) — but then it got quiet. When you’re a parent, you learn quickly that quiet usually precedes trouble. So I went to see what kind of mischief the little one was up to. To my surprise, she wasn’t up to anything at all — she was reading by herself. In the past, whenever Namine would “read” by herself, she would be telling a story, but obviously not actually reading. Not so this time. 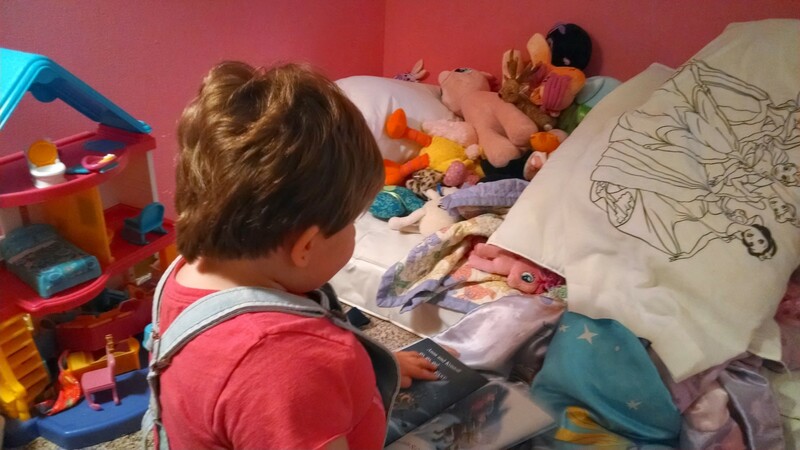 She was reading out loud, quietly enough that we couldn’t hear her in the living room, but loud enough that I could hear her once I came in her room. Namine turned when she heard me come in. “I’m reading, all by myself!” she exclaimed proudly. “I’d like that very much.” I sat down next to Namine on the floor, and she started the book over for me. The other night, after giving Namine her bath, I decided to quiz Namine on spelling some words. In school, she’s been working on words that rhyme — words that end in op, ot, or og, for example — but always visually. She looks at the words and reads or spells them. Boy, did she ever. I think we ended up doing over half a dozen words, and she was right the first time, every time. Jessica told me later that it was the first time she’d done something like that, spelling words without looking at the letters written down (either on a board, computer screen, or paper). It was apparent to me, watching her spell the words, that she was visualizing the letters and seeing them being put together in her head. It was pretty cool to see. She’s like Jessica and myself in that regard; we’re visual learners, too. But you know what they say: if children don’t learn the way you teach, then you need to teach the way they learn. By the way, an addendum from Jessica: Namine read her entire Brave book — a reader similar in level to the Frozen one — in the car to Jessica herself and then again in a Hangouts session with her teacher, Miss Sara.